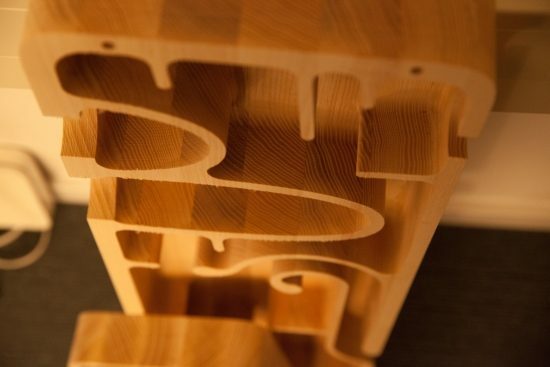 This is the inside of a speaker but very special ones at that by Boenicke Audio. 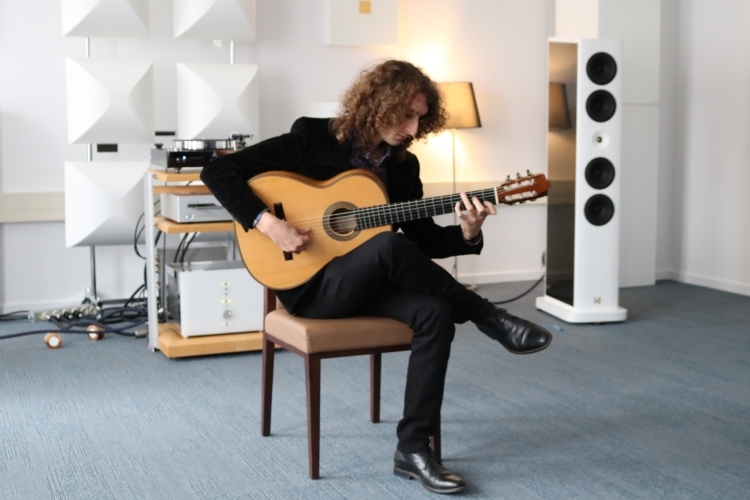 Also, see my short listening impressions as part of the EnoSound show in Barbastro. Cute but mighty impressive when you hear it! 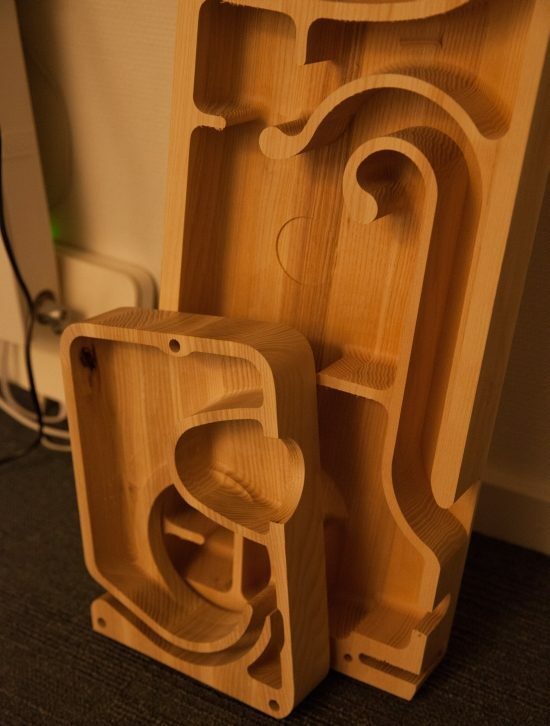 These W5 speakers are made from solid wood: the insides can be seen below (the smaller enclosure). On its side is a relatively big woofer. The seemingly single driver on the front is actually a dual-concentric design. 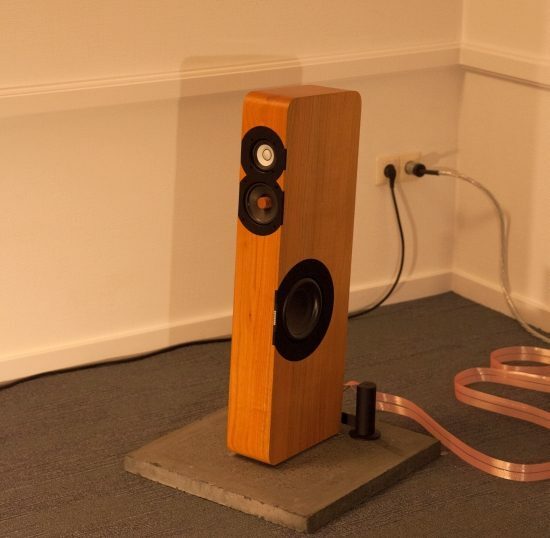 These W8 speakers may be almost as thin as the speaker cables, they sound voluptuous and big. Can you guess what device this is? Should be a dead giveaway, no? Oh my, what a beauty the model 9600 is. Indeed, it’s Zanden, you score 10 points! This model 3000 mk2 from the Classic series was on display only, not connected. 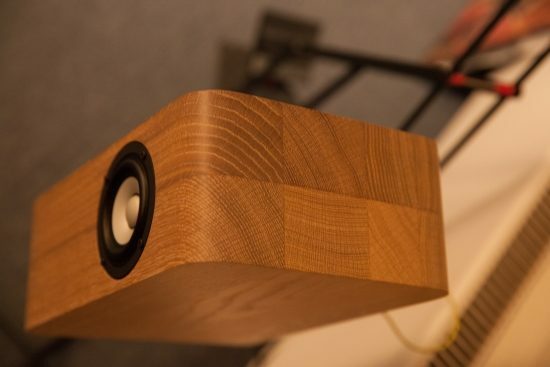 For demonstrating the Kroma speakers, Zanden’s Modern series components were used. Kroma Audio Carmen, a smaller version of the Elektra. 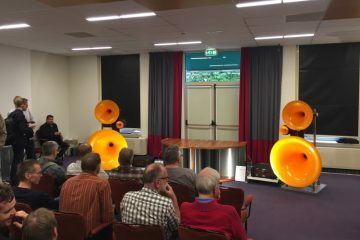 These speakers are driven by a Zanden 8120 tube power amp and 3100 pre-amp in one of the two Harmony Audio Import rooms, supported by Chattelin Audio Systems, Zanden, CAD, RTFS and Kroma, which was one of the best sounds I heard on the show. The sound was hugely dynamic and very realistic. 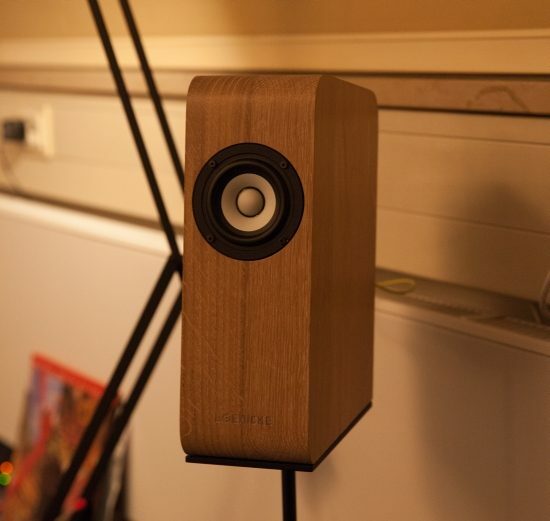 Every time I hear any Kroma Audio speaker, I am again amazed by their authoritative bass and their natural timbre. Ground Control by CAD. 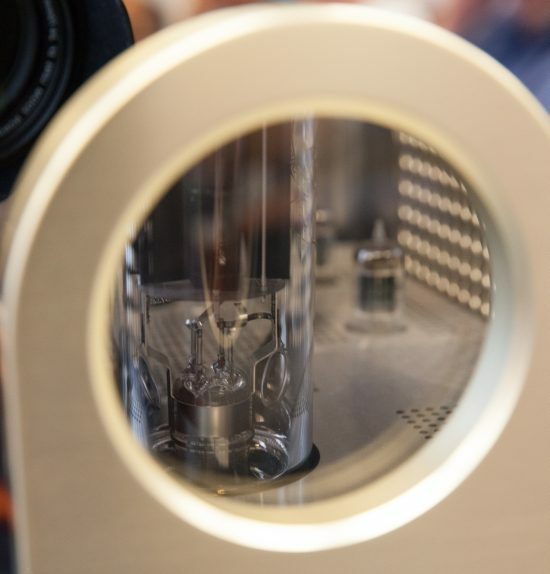 This device is connected to any component’s ground and then reduces high-frequency noise. 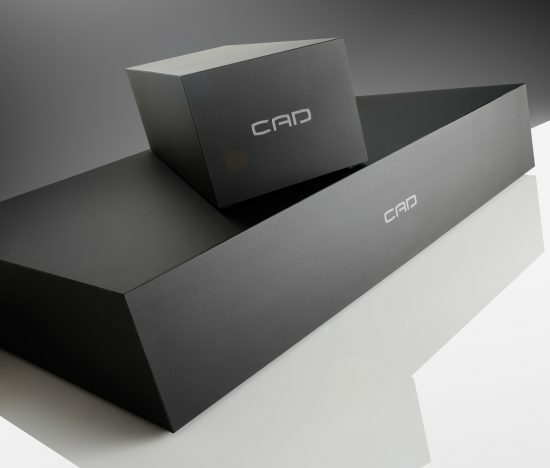 CAD believes that one of the key reasons so many digital audio products “sound digital” is due to this noise. 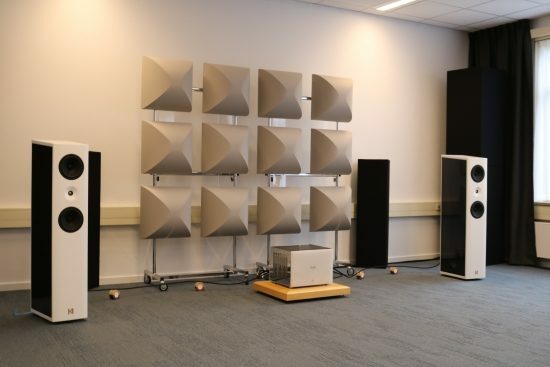 CAD demonstrated in both of the Harmony rooms in combination with the Zanden / Kroma systems. In the room with the Carmen’s, Scott Berry from CAD showed what his Ground Control devices can do for the sound. 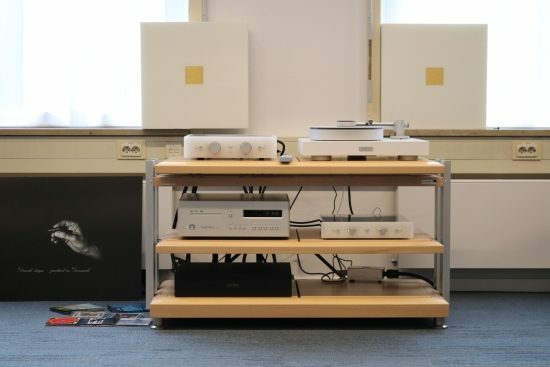 He did this by connecting an unused cinch input on the preamp and the unused S / PDIF output on the CD player to the Ground Control device via cables that connect only the ground. Well: this was clearly audible! 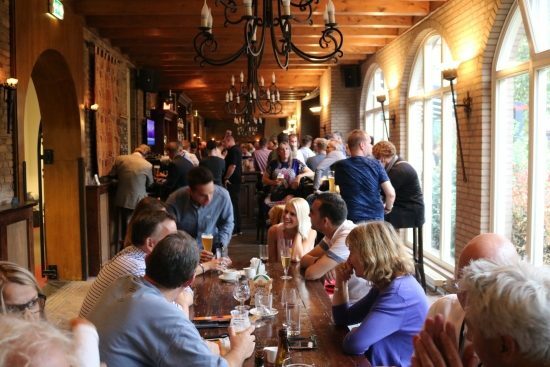 Whether it was better or worse is perhaps a matter of taste but what I heard was that the sound with the device connected was more relaxed, with transients seeming less sharp and voices sounding rounder, smoother and freer. Was the recording simply a little rough and was it made softer, or was there actually hardness in the system due to mains pollution that the device removed? Who knows. But that it makes a considerable difference is clear. Here’s Scott Berry, demonstrating his Ground Control device. 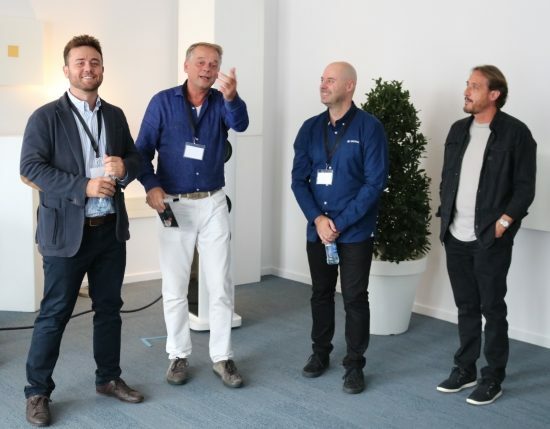 Left to right: Cayetano Castellano, international representative for Kroma Audio, Ben van Leliveld of Harmony Audio Import and Miguel Castro and Javier Millán of Kroma Audio. 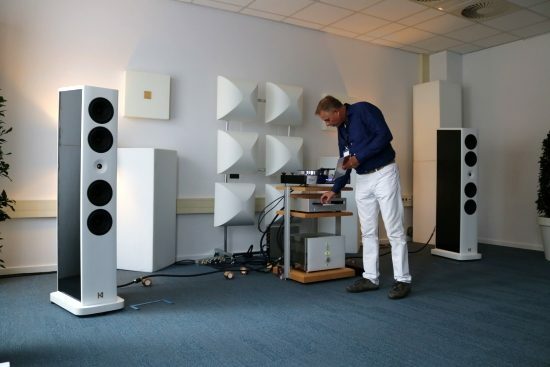 These last two gentlemen are solely responsible for the Kroma loudspeakers but ever so modest. Ben van Leliveld cueing a CD. He explained that while he likes Music Servers, he finds CD players more charming in their operation and also more reliable on shows. I certainly can’t argue with that last statement. 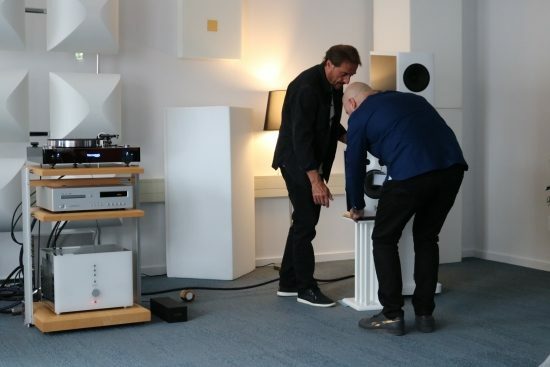 Javier Millán and Miguel Castro of Kroma Audio, carefully positioning the Mimis. Here the Mimis are placed on the brand new Krion stands. 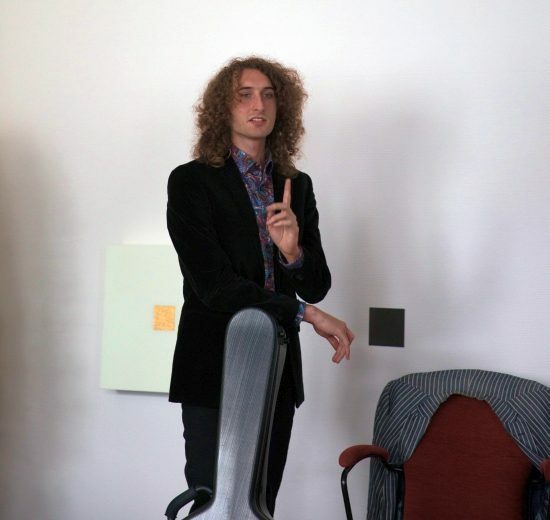 Jeff Heijne, Dutch Flamenco guitarist, introduced by Ben. 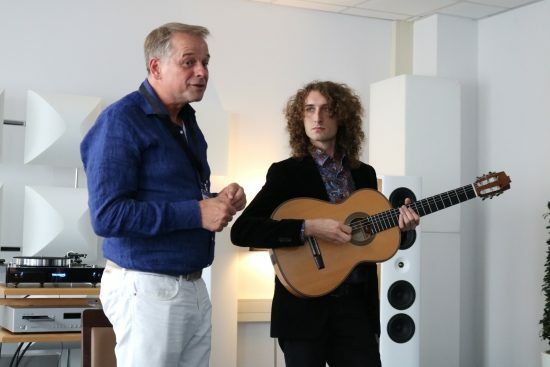 While I found it interesting to compare live guitar sound to recorded sound, I have no real knowledge of Flamenco music and so can’t really comment on Jeff’s abilities. Well, I have heard some Flamenco live music when I was in Italy many years ago but I don’t recall very much of it other than that I found the tapdancing lady very interesting. That, in turn, made me realize that the tapdancing as part of the playback on the Zanden-Kroma system sounded utterly realistic! 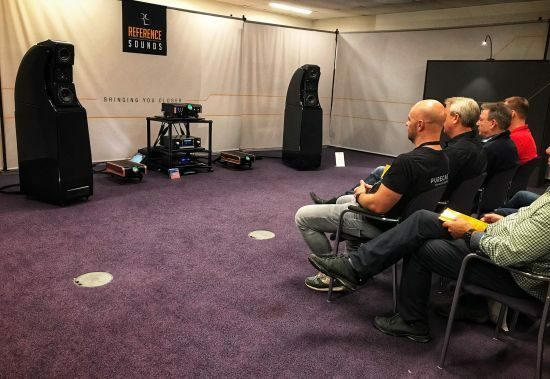 The Elektras clearly are superb speakers and evidently, they pair just as well with Zanden as with CH Precision (see the report of the EnoSound show in Barcelona). 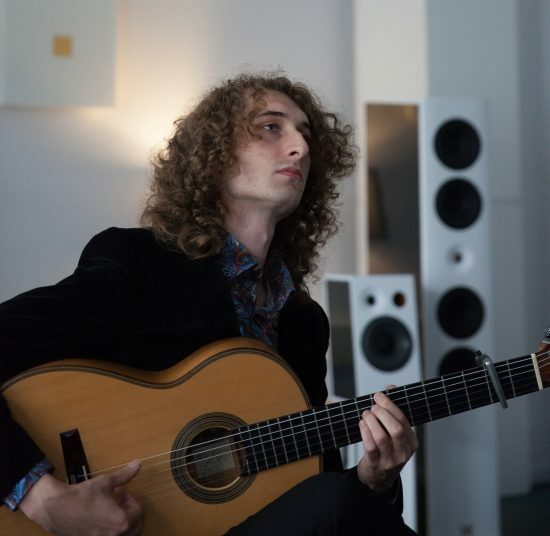 What I think will be interesting to note is that the guitar always sounded sonorous, never screechy, not even when he switched from gentle soft passages to the loudest he could play the guitar. Not once was the sound annoying. Yet, the dynamics were all there and, of course, the transients were as sharp as they can be. 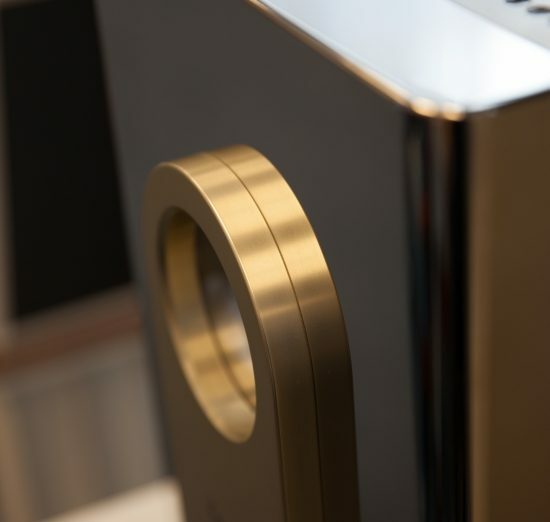 This means that most audio systems still modify the sound one way or another. 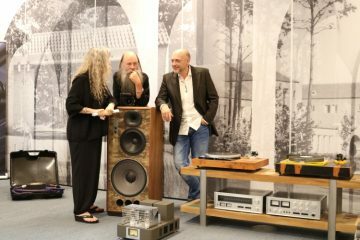 The Biggest joined by the smallest, but both superb speakers! While the big Elektras are not on the review agenda, I am going to review the smaller Carmen model (not pictured here) soon. And perhaps there’ll be more after that. 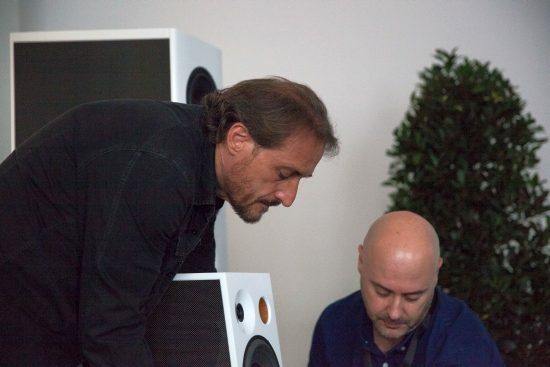 In any event, I liked what I heard and I can’t wait to examine these speakers in the comfort of my own listening room. 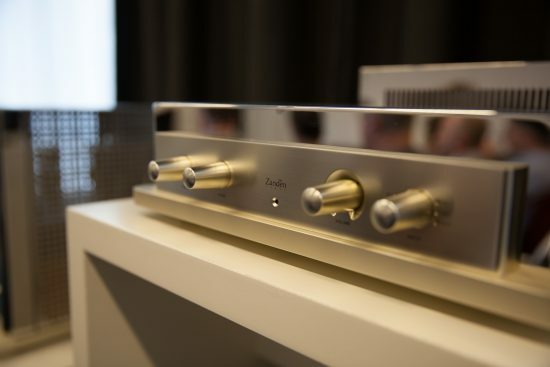 Also, see the Hifi Deluxe Kroma Mimi impressions as part of the Munich High-End audio show). Jeff wittingly answers a question from the audience about how long he has had to practice until arriving at his current level: only 20 of his 22 years. His bio states that he started playing at the age of 8. So, he’s not even joking, really. All that I have left to add at this point is that we ran into Michael of Reference Sounds, just as we left well after 17:00. 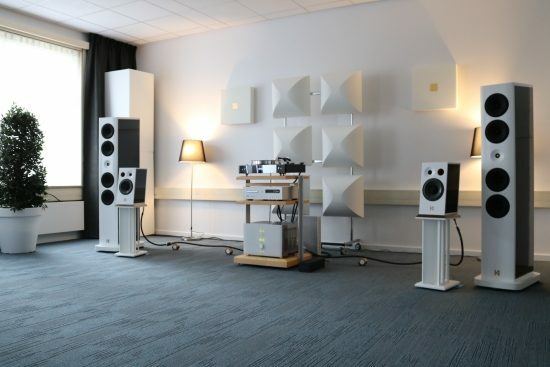 When he asked me if I had seen and heard the Wilson Alexx speakers in his 120 square meter room, where he used Dan D’Agostino Momentum M400’s and preamp, Transparent XL cables and Wilson Audio ALEXX speakers, it occurred to me that we must have missed an entire hallway! This is the frustrating part of the X-fi: I always get lost and even when surrounded by friends still tend to walk the same hallways multiple times, but that’s ok. That we’ve completely missed one, however, is a damn shame! Especially since Frank of A Tube High Fidelity just told me that he thought the Alexxes were the star of the show! Below is a photo that Michael sent me. 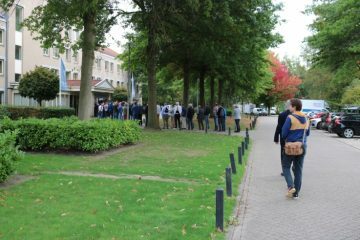 Of course, we continued the festivities at restaurant Claudius in Nijmegen but that’s for another story.